Back from the hobby graveyard, 2016 Panini Plates and Patches Football marks the return of the hit-based line. Each box contains an autograph and prime relic as well as a printing plate. 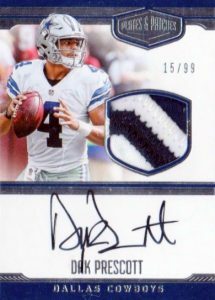 Updating the design and further stressing individual card rarity, every possible pull in 2016 Panini Plates and Patches Football checks in at 99 copies or less. Showcasing the popular first-year players, Rookie Patch Autographs documents the standouts of the 2016 draft with an auto-relic combo. The base version is numbered under 100 copies and limited Gold and Red parallels feature more premium swatches. 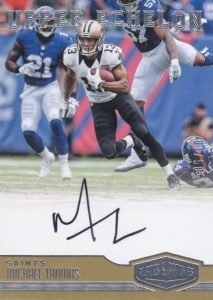 Combining with the RPA cards to fall in every box, on-card signatures can be found for several inserts. Canton Calligraphy highlights Hall of Fame members and Signal-Callers autographs stick with the quarterbacks. Paying homage to the truly elite, the Game Changers autographs use taglines like "Five MVP Awards" for Peyton Manning. 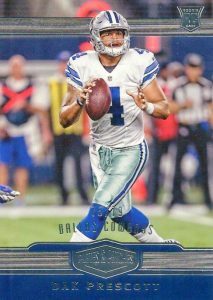 2016 Panini Plates and Patches Football also packs some impressive memorabilia with one prime relic card per box. 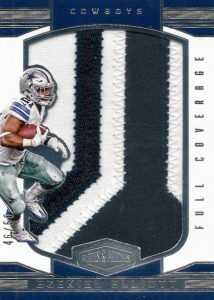 Full Coverage and the multi-player Dual Coverage relics incorporate jumbo swatches while Rookie Quad Jersey mixes four quality pieces for one player. 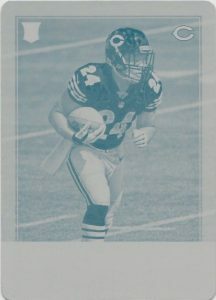 Finally, playing into the brand name, each box of 2016 Panini Plates and Patches Football yields a one-of-one Printing Plate from sets across the Panini Football lineup. 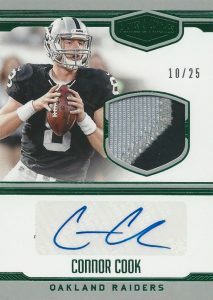 CONNOR COOK 2016 PANINI PLATES & PATCHES ROOKIE JERSEY AUTOGRAPH #'rd 54 99 !! Check out specific cards from each set or insert for sale using the links below. 200 cards. Base - #/99, Retired/Rookies - #/79. 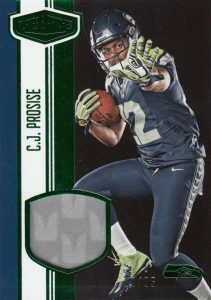 Shop base cards on eBay. 42 cards. Shop on eBay. PARALLEL CARDS: Blue (#/50 or #/25)*, Green (#/25 or #/10)*, Red (#/10 or #/5)*, Gold 1/1. PARALLEL CARDS: Blue #/25*, Green #/10*, Red #/5, Gold 1/1. *Not all subjects found in Blue/Green parallels. * View the full spreadsheet for specific details. 16 cards. Serial numbered #/50. Shop on eBay. 42 cards. Serial numbered #/50. Shop on eBay. PARALLEL CARDS: Blue #/25, Green (#/10 or less)*, Red #/5, Gold 1/1. 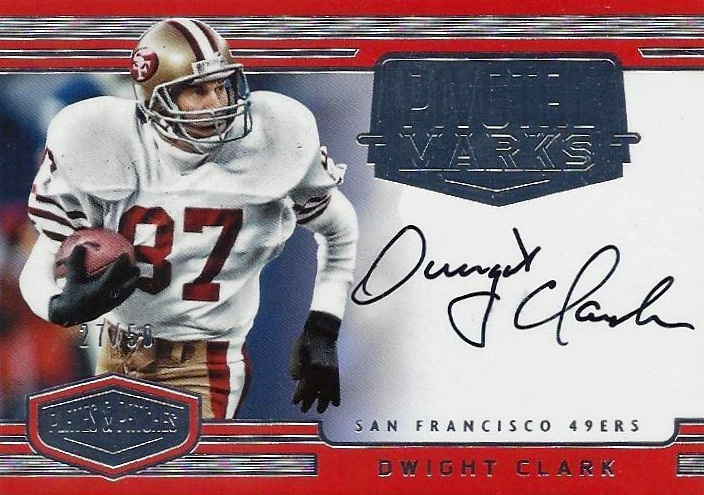 PARALLEL CARDS: Blue #/50 (Only Dwight Clark), Green #/10 (Clark - #/25)*, Red #/5 (Clark - #/10), Gold 1/1. PARALLEL CARDS: Blue (#/50 or #/25)*, Green (#/25 or #/10)*, Red (#/10 or #/5), Gold 1/1. 40 cards. Serial numbered #/75. Shop on eBay. 20 cards. Serial numbered #/50. Shop on eBay. 40 cards. Serial numbered #/50. Shop on eBay. PARALLEL CARDS: Green #/10*, Red #/5, Gold 1/1. PARALLEL CARDS: Blue (#/50 or #/25)*, Green (#/25 or #/10), Red #/10 or #/5, Gold 1/1. *Not all subjects found in Blue parallel. * View the full spreadsheet for specific details. 1 per box. Serial numbered 1/1. Shop on eBay. Full list not available. These come from various Panini Football sets. What is better Panini plates and patches or 2016 Panini select? Hey trey so there is a base set to this product, yes or no? That was never expressly stated so we won’t know until the checklist is released. Panini is very inconsistent about their checklists so it could be up at any point this week. 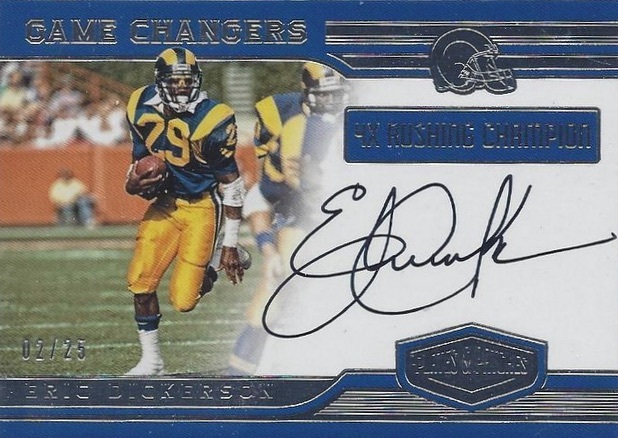 Some of the on card autos and patches look really decent and there’re defienetely some nice hits in this product. Printing plates are a crapshoot within a huge range of players and Panini products and there’re no real big hits as they’re all not signed. Nevertheless for me the high quantity of parralels is ruining it for me, I’ve a hard time to understand why there’re numbered variants in Blue, Green, Red, Silver, Gold …. (a Broncos variant in green looks pretty ugly), this is just watering down the product. I’ve seen a lot of breaks now and for your 99 bucks you can get a few nice cards, but also completely trash. As it’s pretty tough to hit a Dak/Zeke or something for your PC with just 5 cards (1 Auto, 1 Relic, 1 Plate, 2 x Base) , I’d rather scoop up the cards I like on the secondary. 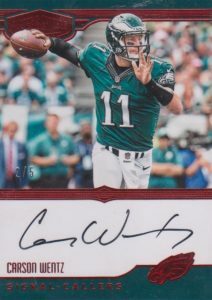 2016 Plates & Patches Factory Sealed Football Hobby Box Carson Wenrz AUTO RC ? ?